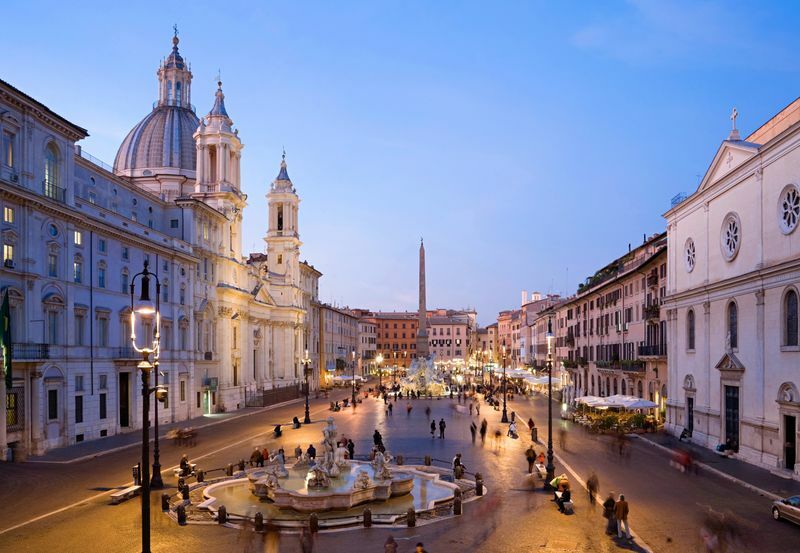 The Piazza Navona was originally a horse racing venue in ancient Rome. When the empire fell, buildings were gradually constructed along the long oval, giving the piazza its current, unusual shape. There are many cafes here; check the menu outside each place and have a leisurely lunch. You'll spend about $20, but after a full morning of sightseeing, you will enjoy sitting down and resting. The centerpiece of the piazza is the Fountain of the Four Rivers by the Baroque sculptor Bernini. The four statues represent the Danube, Rio de la Plata (the New World), Ganges, and the Nile (whose face is hidden because the source of the Nile was as yet unknown during the 1600's).